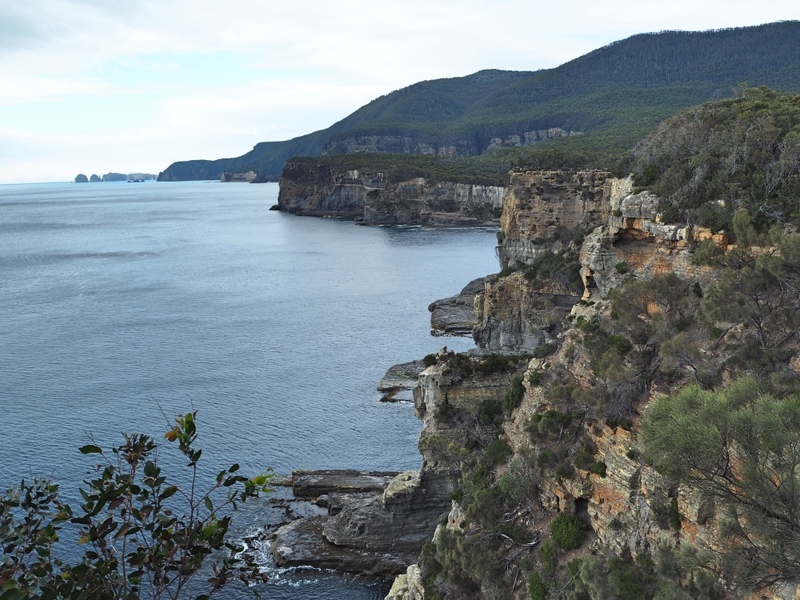 The Tasman Peninsula is a popular part of Tasmania known primarily for its main attraction, the Port Arthur Historic Site. Of course, while you absolutely must visit Port Arthur, you shouldn’t stop there! There are so many things to do on this small peninsula that you’ll want to spend at least a few days enjoying the sights. 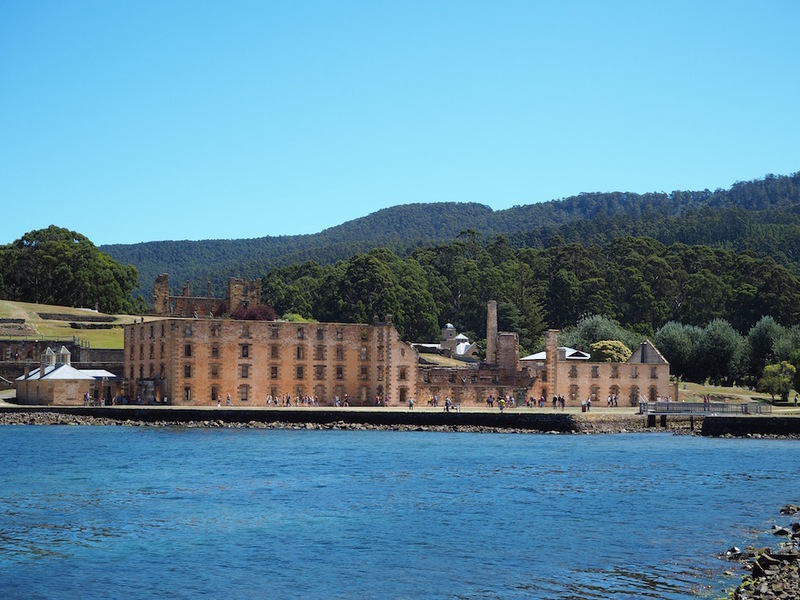 The Port Arthur Historic Site is a popular world heritage listed landmark on the Tasman Peninsula. This old convict prison is set on a hundred acres of land and was used in the 18th and 19th centuries. 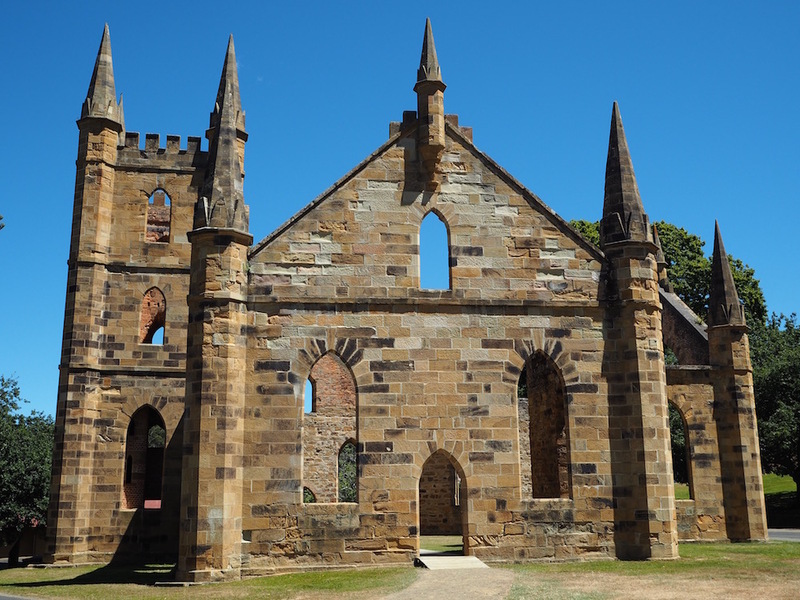 It is fascinating to wander around Port Arthur and learn about all of its history and to get a taste of what life was like for its inhabitants back then. Entrance to the site costs $37 and is valid for two consecutive days. It also includes a forty-minute guided tour of the main grounds which gives you a comprehensive introduction to its history. Also included is a twenty-minute cruise around the harbour and the surrounding islands. The site is set in some truly beautiful natural surroundings which make it hard to imagine the harsh daily existence that the convicts and minders would have faced. The ruins of Port Arthur’s historic site. The ruins of the old convict church in Port Arthur. 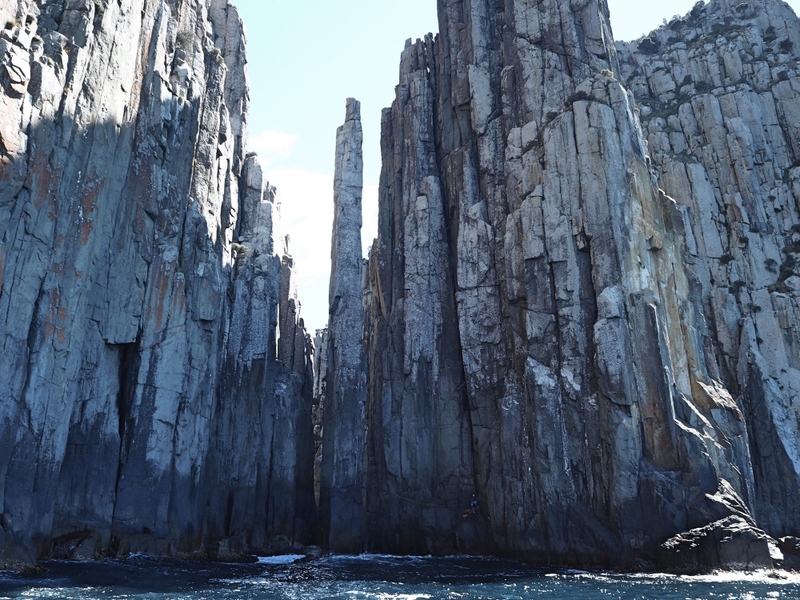 Pennicott Wilderness Journeys offers a fabulous speed-boat cruise that you really should do while visiting the Tasman Peninsula. 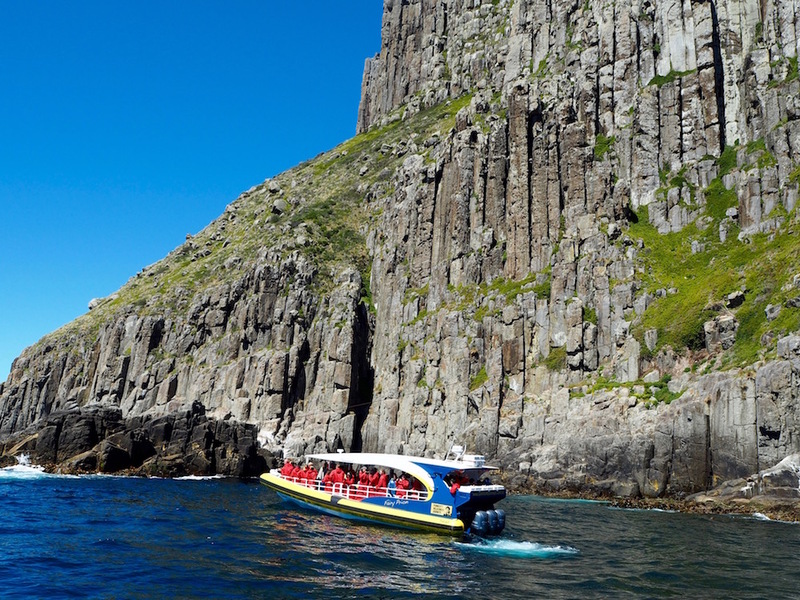 The cruise explores the peninsula’s spectacular coastline with its rocky cliffs, eroded rock formations and many caves. You’ll see a totally different perspective of the coastline than what you get from land. Another reason to take the cruise is for the wildlife. Depending on the season you’ll see migrating whales, playful dolphins, sun-bathing seals and an abundance of seabirds. It costs $135 per adult but it is totally worth it. It was the highlight of our trip! The Pennicott Wilderness Journeys cruise. The Tasman Arch as seen from the cruise. Cape Hauy and its candlestick as seen from the cruise. 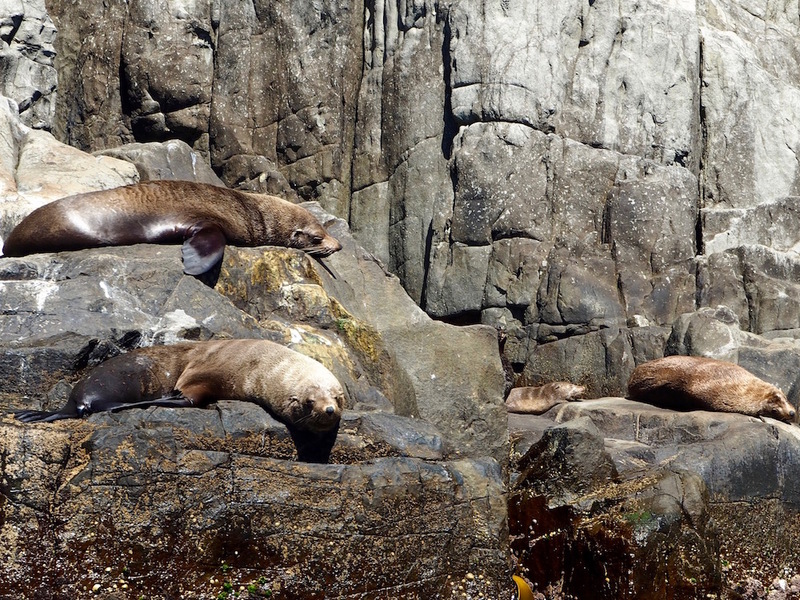 The friendly seals on Tasman Island. Looking down on the Tessellated Pavement from the lookout. The Tessellated Pavement is an interesting rock platform formed from erosion that has taken place over millions of years. This erosion has divided the surface of the platform into a series of roughly similar rectangular plates carved into the rock. It is well worth a visit as this type of formation is extremely rare. 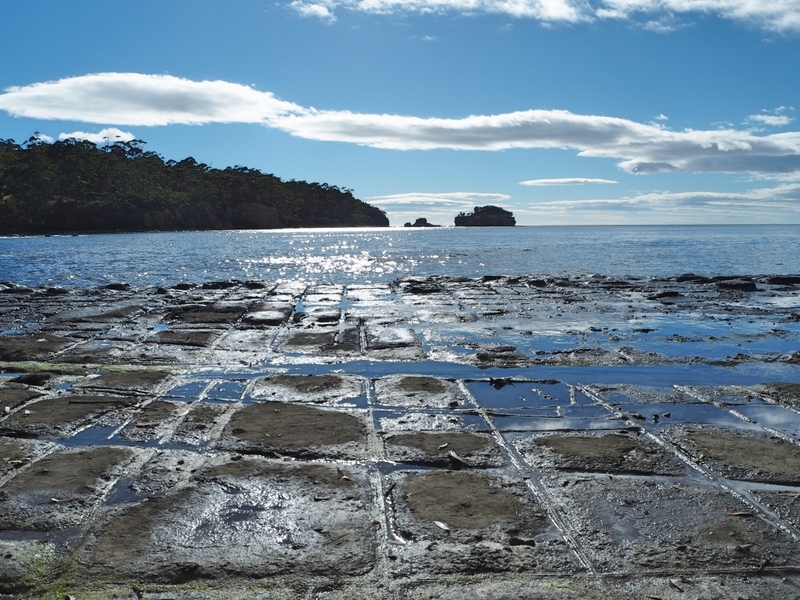 The view across theTessellated Pavement from Pirate’s Bay. You can see the pavement from the lookout at the carpark but for the best view head down to Pirate’s Bay, a short walk down the hill from the carpark. There are some great photo opportunities but watch where you walk as it can get very slippery! Tip: Make sure you check the tide before going as it is best seen when the tide is low. 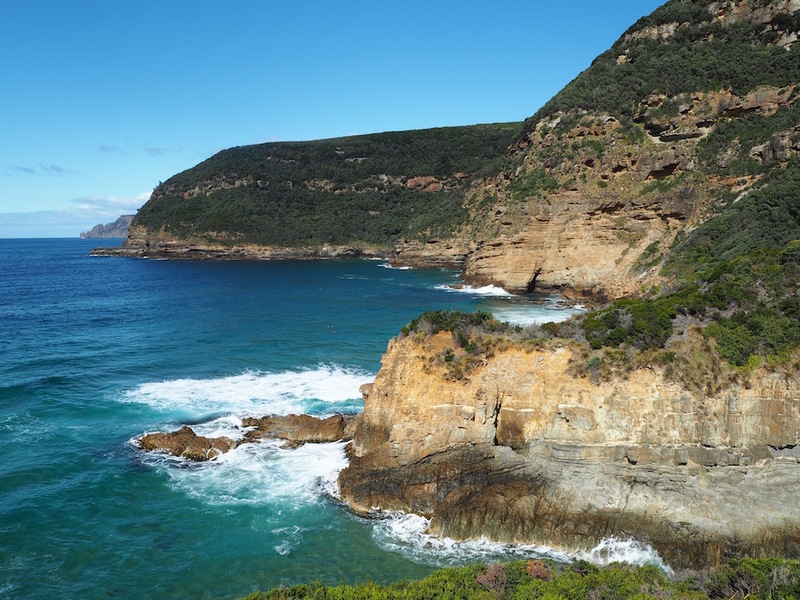 There are many hikes to be done on the Tasman Peninsula. 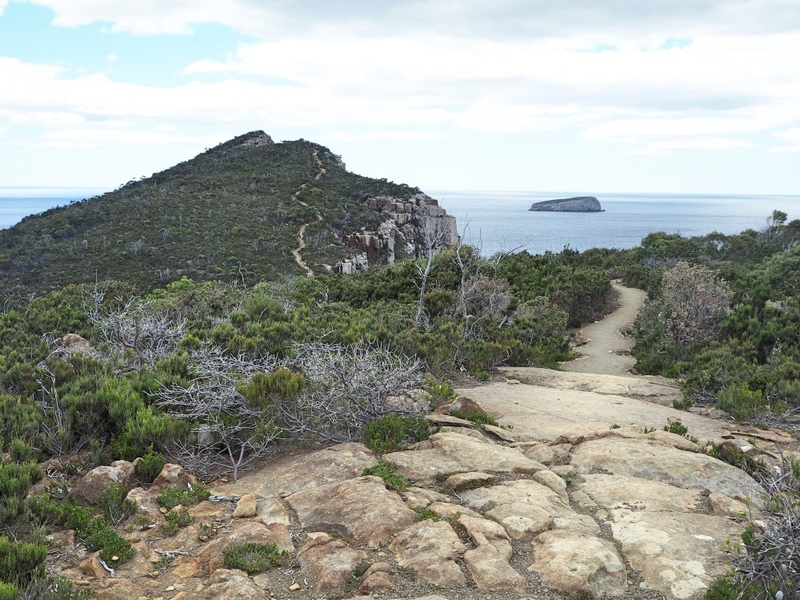 The brand new, multi-day Three Capes Hike has become the most popular of them. Not surprisingly it explores three capes along the peninsula (Raoul, Pillar and Hauy). If you don’t have the time or the energy to do such a big hike, don’t worry. There are many shorter hikes you can do. We loved the half day Cape Hauy hike which has some incredibly breathtaking coastal scenery and views of the coastline. Stunning views from Cape Hauy. Tackling the fantastic hike to Cape Hauy! 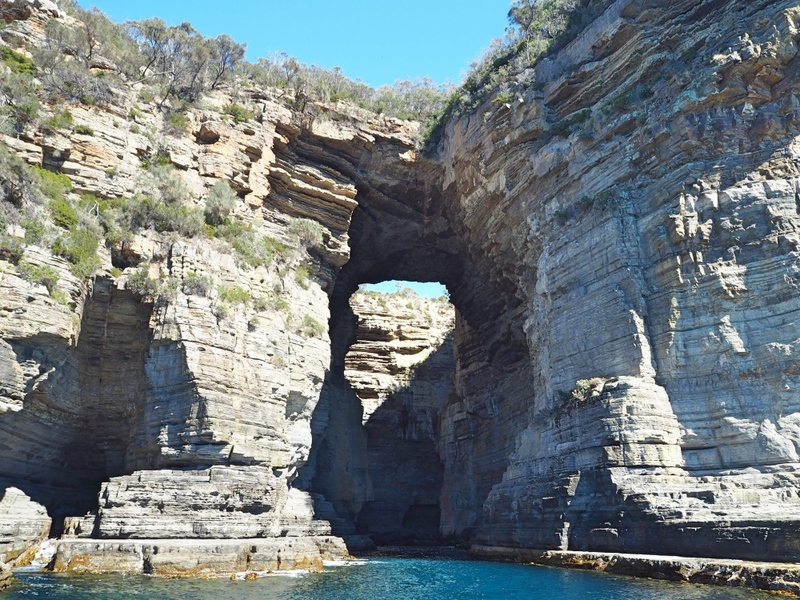 The Tasman Arch is a great example of how impressive mother nature can be! It is a rocky arch carved out over millions of years by the power of the sea. 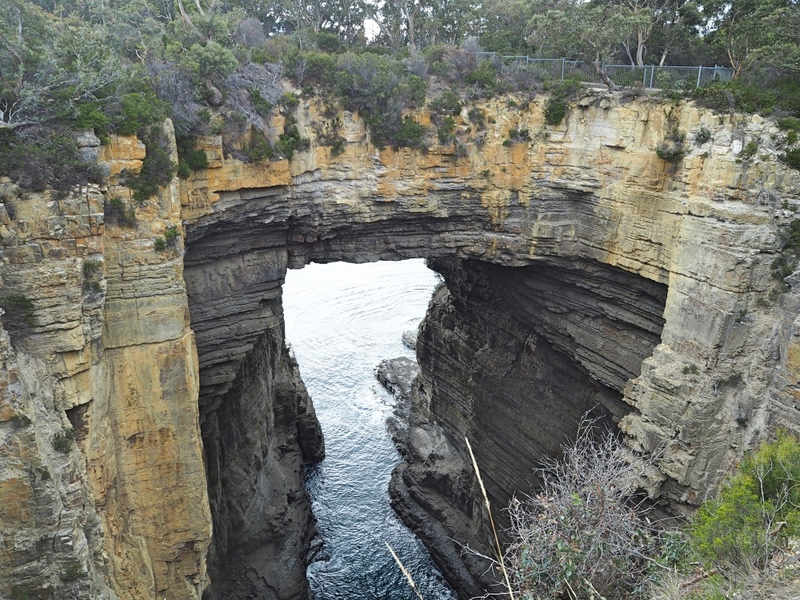 Make sure you take the walking track around the back of the arch for some stunning views of the rugged coastline. From the arch, it is only a hundred meters walk to the Devil’s Kitchen. At the Devil’s Kitchen, you can look down deep into the gorge and hear the sound of the crashing waves below. Looking out along the coast behind the Tasman arch. Approximately one hundred stairs will take you down to a little lookout from where you can peak into the deep opening of this remarkable cave. If you go at low tide you’ll be able to jump down onto the beach and enter the cave itself. Do not try this if the tide is coming in as water can pour powerfully through the cave without warning and it can be quite dangerous if you are caught off guard. 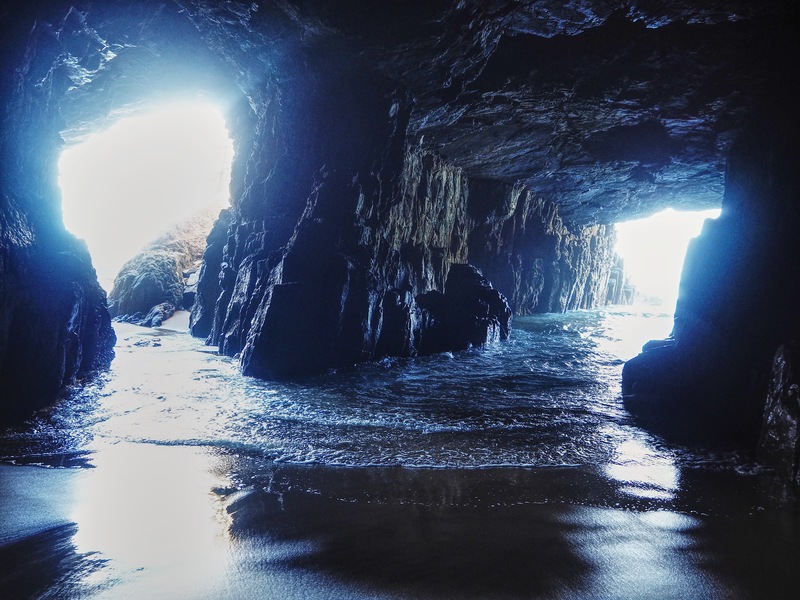 Inside you will find two openings into which the sea enters the cave. It really is a remarkable cave! Looking out to the sea from inside the Remarkable Cave. Don’t forget to check out the Maingon Bay lookout before or after you visit the cave. This lookout offers spectacular coastal views out as far as Cape Raoul. You will also be able to watch the surfers tackling the waves below. The beautiful view from the Maingon Bay lookout. 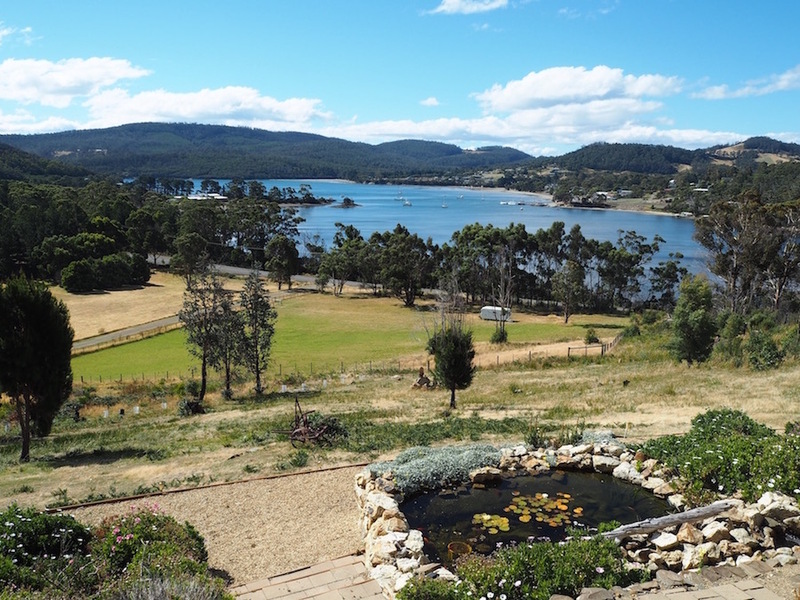 For a relaxing lunch with beautiful views over the bay and the nearby lavender fields, stop at the Port Arthur Lavender farm. Be sure to leave room for some lavender indulgences such as their Lavender chocolate and Lavender ice cream! Their gift shop also has a great selection of Tasmanian made products and of course all things lavender. If you dare! Every night once the sun has set, you can take a lantern-lit ghost tour of Port Arthur itself. The tour last for about ninety minutes and will take you into several haunted buildings at the historic site, where the same ghosts have been spotted by several people and often entire groups of tourists! Whether or not you believe in ghosts, it’s fun to do it just for the experience and the expertly told ghost stories. Thankfully we didn’t see any ghosts but we did see lots of wildlife! Depending on the swell you may or may not see something wild and spectacular here. 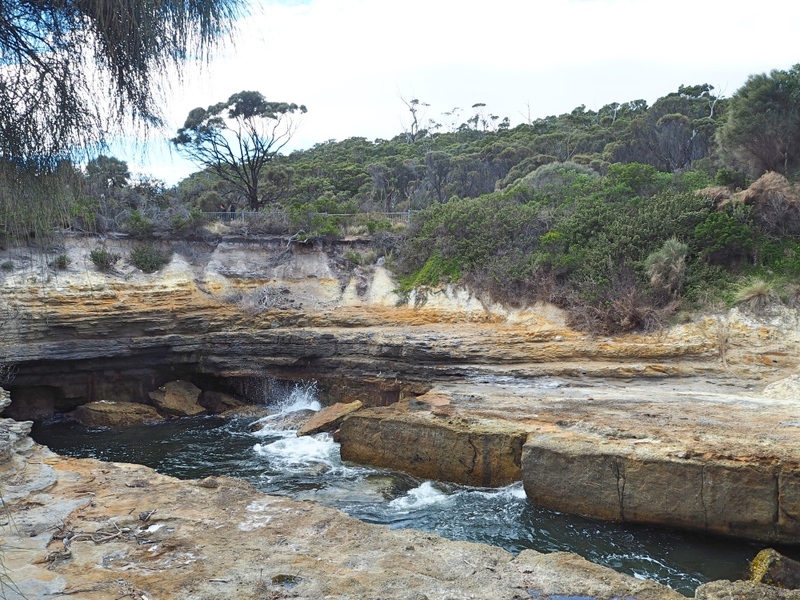 When we visited it, the blow hole was looking pretty wimpy but it is still worth a stop even on a calm day. A short walk around behind the blowhole will take you to a lookout with views out over the coast. For the best fish and chips in Tasmania, stop at Doo-lishus Fish and chips in Doo Town. Doo-lishus is not a restaurant, but a food truck, parked in the car park of the Tasman blow-hole. It serves the freshest fish and chips as the fish comes straight from the ocean right next door! DOOLISHUS! 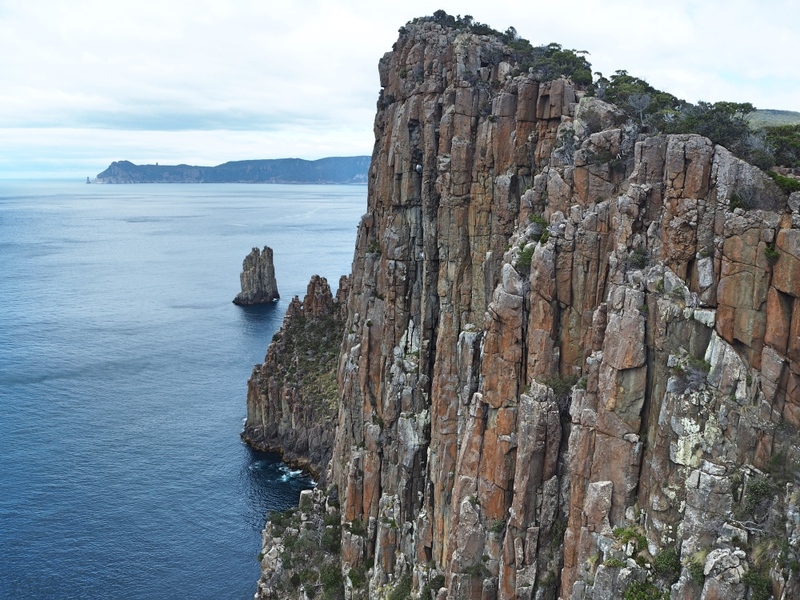 The Tasman Peninsula is a must visit destination for any trip to Tassie. You could tackle the majority of these sites in one day but if you’d like to do some of the hikes or really explore the peninsula fully you should stay for at least a couple of days. 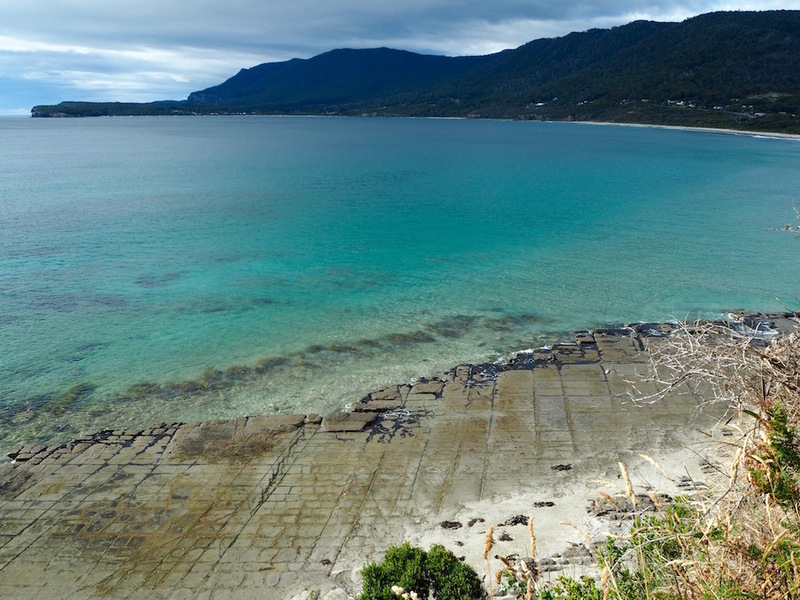 No matter how long you stay, you will fall in love with this beautiful part of Tasmania and you will not want to leave! For overnight accommodation on the Tasman Peninsula, we really recommend a stay at the Storm Bay Guest House. They offer spectacular views over Parsons Bay and an extremely friendly stay. The awesome view from our room at the Storm Bay Guest House.